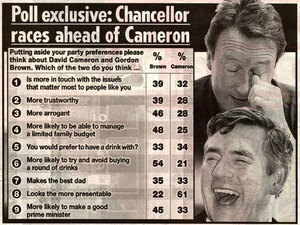 On the credit side for the Tory leader – David Cameron is not seen as being as arrogrant as Mr Brown, slightly better drinking company, less likely to avoiding buying a round of drinks and much more presentable. This poll (1PM ADDITION: the sample for which appears somewhat slanted towards Labour supporters according to a post on PoliticalBetting.com) and other recent surveys underline the mountain that the Conservative leadership still has to climb. After the euphoria of Mr Cameron’s first couple of months the durability of Gordon Brown’s popularity will alarm some of the Notting Hill set (who are under fire in today’s newspapers).